How is brachytherapy “new again,” 30 years on into Dr. Sylvester’s career? 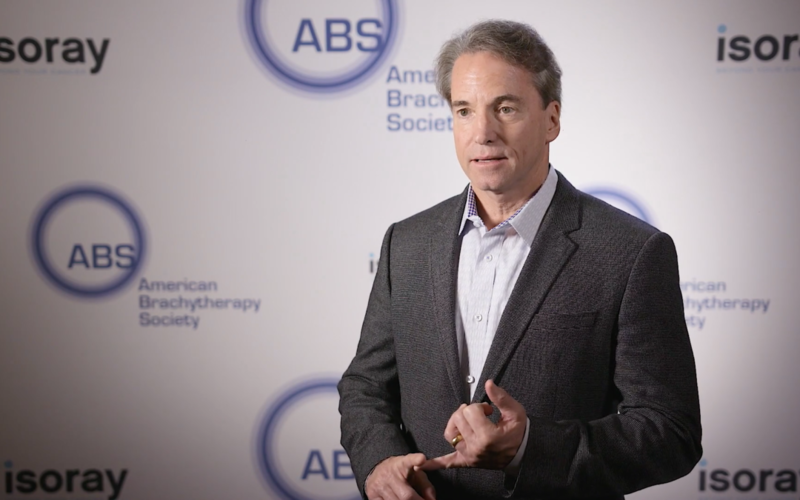 Radiation Oncologist Dr. John Sylvester, MD shared a few minutes with us at ABS 2018 discussing recent advancements in prostate brachytherapy and their implications for prostate cancer patients. “Prostate brachytherapy has the highest cure rate for prostate cancer regardless if it’s low-risk, intermediate or a very high-risk disease,” Dr. Sylvester says. He cites improvements to imaging equipment and analysis, improvements in knowledge regarding required “dose” rates, and a better understanding of the volume of radiation doses normal tissues and structures can tolerate as the top ways brachytherapy has evolved in the past three decades. A 2016 piece in the Journal of the American Medical Association indicated patients with high-risk prostate cancer (Gleason 9 and 10 scores) not only have better cure rates, but their chance of overall survival and limiting the instances of cancer [metastasizing] to the bones, are all dramatically better with prostate brachytherapy as compared to EBRT or radical prostatectomy Dr. Sylvester says. Evidence demonstrates a new isotope made available for prostate cancer brachytherapy in 2004, Cesium-131, shares a role in brachytherapy’s renaissance with its higher energy and rapid side effect resolution.